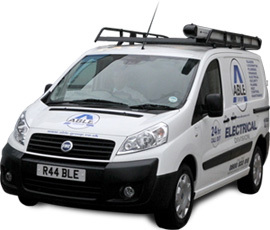 When an electrical problem presents itself, be it in domestic or commercial properties, Able Electric are on hand to provide an emergency response 24 hours a day. We realise your safety is at hand and because of this only supply fully qualified electricians who are security vetted for your peace of mind. Common problems such as light failure, socket problems or complete power failure can halt a business’s flow of work and cause untold problems for domestic residents. With our trained and helpful operating staff available on our free phone services, you can be rest assured your electrical problems will be dealt with in a fast and efficient manner.